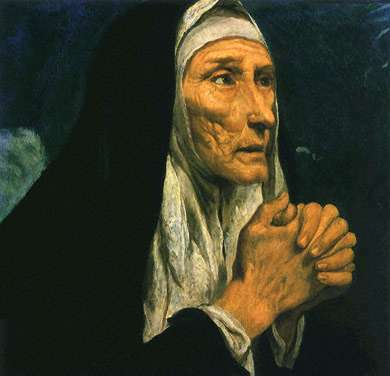 St. Monica was married by arrangement to a pagan official in North Africa, who was much older than she, and although generous, was also violent tempered. His mother Lived with them and was equally difficult, which proved a constant challenge to St. Monica. She had three children; Augustine, Navigius, and Perpetua. Through her patience and prayers, she was able to convert her husband and his mother to the Catholic faith in 370· He died a year later. Perpetua and Navigius entered the religious Life. St. Augustine was much more difficult, as she had to pray for him for 17 years, begging the prayers of priests who, for a while, tried to avoid her because of her persistence at this seemingly hopeless endeavor. One priest did console her by saying, "it is not possible that the son of so many tears should perish." This thought, coupled with a vision that she had received strengthened her. St. Augustine was baptized by St.Ambrose in 387. Monika died later that same year, on the way back to Africa from Rome in the Italian town of Ostia.